I’ve just come back from a long weekend in Jersey. 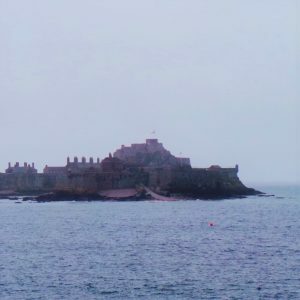 It’s the largest of the Channel Islands and in fact it’s so close, just 100 miles from mainland Britain, and a 40 minute easyJet flight from Luton airport that I can’t believe I’ve never been there before. It’s packed with amazing beaches, fabulous waterfront restaurants and bars and plenty of culture in the form of castles, museums and heaps of history. So here’s my top tips on ways to get around, see the sights and save money. I jumped on an easyJet flight at Luton Airport which took just 40 mins once we were up in the air. If you’re flexible with dates, you can bag flights from under £10, yes really! I found some going for just £7.93 in June, so if you’re flexible with your dates you could bag yourself a return ticket for under £20. If you’re flying in, make the most of the free maps and island guides at the airport. Plenty of ideas for things to see and do along with tips from the locals, so it’s a great way to start your trip. You can hire a car to get around but you’re looking at around £45 a day all in. As well as the big names, there’s a couple of smaller companies offering car hire on the island but getting around is actually really easy thanks to Jersey’s brilliant bus company So I went for the bus option. You’ll pay just £2 for any single trip and you can buy an all day pass for unlimited travel for £8. In fact I don’t think I’ve ever anywhere with such frequent buses. I never waited more than 5 minutes for one and if you’re catching one from St. Helier to get out and explore the island, it’s very easy to find the bus station as it’s just behind the Liberty Wharf Shopping Centre near Liberation Square. And there’s a really helpful information desk if you get stuck and need a hand. Check out the ‘What’s On’ guide for discounts, deals, special events and free days out. A great day trip is to walk out to Elizabeth Castle along the causeway at low tide although you’ll usually pay £11.60 to get into the castle. So save money by going there on Saturday 28th April when you can get in totally free from 10am through till 2pm and enjoy a whole heap of special tours and events. All thanks to a collaboration between Jersey Heritage and Lloyds Community Banking. Jersey may be just nine miles by five but it’s got fifteen miles of stunning beaches. 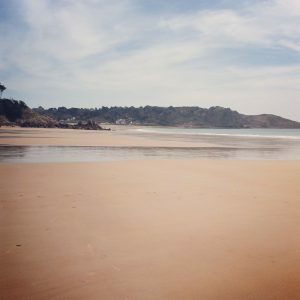 Two of my favourites are St Brelade’s Bay and St. Aubin’s Bay. 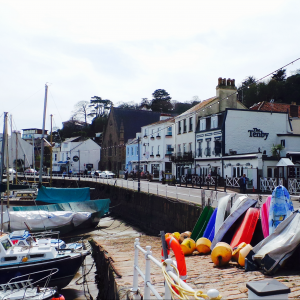 You can catch the bus from St. Helier to St. Aubin for £2, enjoy lunch at one of the harbourside pubs like the Tenby and then walk back to St Helier across the beach at low tide. It’s about a three mile walk so easy enough and only takes about an hour. There’s plenty of cash machines on the island, but as Jersey isn’t part of the UK, it means you may be be clobbered for ‘overseas’ charges if you use your debit and credits cards while you’re there. Check any charges with your bank before you go, but there are some cards that don’t charge any extra fees when you use them outside the UK. These include both the Santander Zero and Halifax Clarity credit card.